This tab allows you to set your preferences for syncing, and to access a variety of other sync-related functions. If the Projects to Sync policy is enabled for you, the Project list controlled by administrator check box on this tab will be selected by default, but you may clear the check box to customize the projects you wish to sync. If you select the check box again, only projects designated in this policy will be synced. Set your preferences as described in the table below. 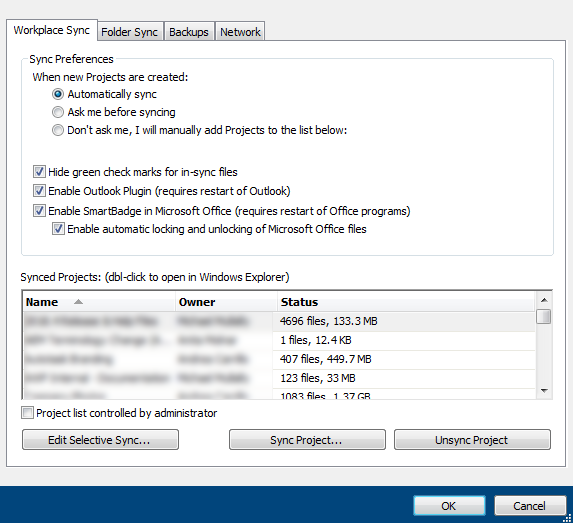 Automatically sync: Select this options if you would like Workplace to sync all new projects without your interaction.. Ask me before syncing: Select this option if you would like Workplace to prompt you before syncing new projects. Don't ask me, I will manually add projects to the list below: Select this option if you only want to manually control which new projects are synced. Hide green check marks for in-sync files Select this option to hide check marks on files within the Workplace folder that are fully synced. This feature, which works in conjunction with SmartBadge, allows Workplace to automatically lock and unlock Microsoft Office files that are synced to Workplace when you open or close them. This option is only available when the Enable SmartBadge in Microsoft Office option, described above, is selected.